If you have a general question or a query regarding the account application procedure or the services we offer, you can contact a Deltastock representative via our Live Chat service. If you want to share your opinion or submit a query, please fill out our feedback form. If you are experiencing a technical problem or would like to request a presentation of our trading platforms, you can use the Deltastock Teamviewer Quick Support tool. This is a highly secure and effective screen sharing and desktop presentation software. Click on the button below to download a small exe, then run it (no installation required). You will see the following screen, where you will find a number which is your session ID. 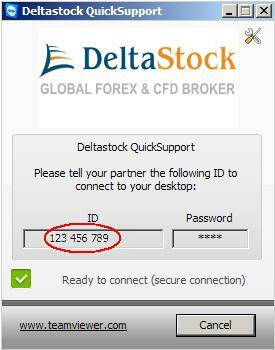 Please contact the Deltastock Support Desk at +359 2 811 50 10 or through the Live Chat and give the operator the above ID so that they can set up a remote support session with you.